Macau casino stocks are still too high. A crackdown on Chinese payment card UnionPay is the latest threat to the gambling bonanza in the former Portuguese colony. Though casino stocks have fallen by almost a fifth in a few months, there’s not much room for disappointment. Macau has traditionally relied on high rollers who arrive on trips organised by so-called junket operators – middle men who extend credit and collect debts in exchange for a commission from casinos. But recent growth has increasingly come from gamblers who arrive under their own steam. These “mass market” players are expected to generate 37 percent of total gross gaming revenue in 2015, up from 23 percent in 2011, Credit Suisse estimates. Though they bet less, mass market gamblers are more profitable because casinos do not need to split their earnings with junket operators. The problem is that these visitors are also responsible for getting their own cash into Macau. UnionPay cards, which impose relatively few limits on overseas purchases, are an attractive option. UnionPay processed transactions worth $45 billion in Macau’s jewelry and watch stores last year, according to Reuters. Nomura estimates total retail sales in the enclave amounted to just $8.3 billion. Assume the remainder was wagered at the tables, and the casinos kept a quarter of it. That would amount to a fifth of the industry’s total gaming revenue in 2013. Authorities are now targeting mobile UnionPay payment terminals which are registered in China but allow customers to withdraw cash in Macau. The crackdown may leave punters with fewer chips to play with. However, determined gamblers can still use their cards to buy goods and exchange them for cash at one of Macau’s many pawn shops. Shares in Macau’s six operators are down by an average of 19 percent since early March. They now trade on an average of 17 times expected earnings for the next twelve months. That’s still above the industry’s rating as recently as early 2013. Macau’s success depends in part on Beijing looking the other way as capital leaks out of the mainland. While a comprehensive crackdown is unlikely, policing mobile payment terminals is a sign that tolerance has its limits. 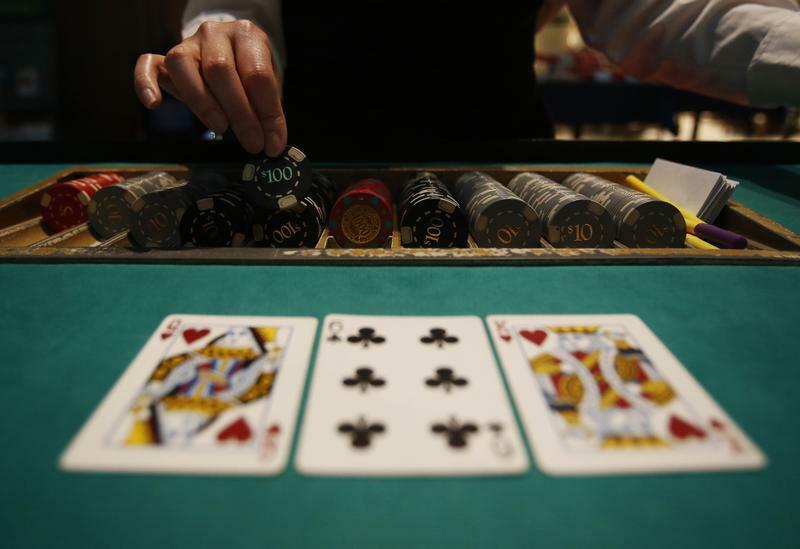 Casino investors are still depending too much on lucky breaks. Macau officials and China UnionPay have cracked down on the use of mobile payment terminals registered on the mainland which are being used in the former Portuguese colony. Shanghai-based UnionPay has stepped up control measures following a recent field inspection with Macau government officials, the Chinese state-backed payment card network told Reuters on May 8. The move seeks to halt gamblers withdrawing money from mobile terminals which are not properly registered in Macau, thereby avoiding exchange fees and China’s capital controls. On May 12, the Sydney Morning Herald reported that 12 people were arrested in February and March by Macau police following an investigation into the use of a card-swiping device from UnionPay. The chief executive of casino SJM Holdings, Ambrose So, said in an article on May 12 in Hong Kong newspaper Mingpao Daily that it was possible a UnionPay crackdown could impact mass market business, where gamblers travel to Macau on their own, rather than through organised junkets. SJM shares fell 2.4 percent on May 13 after the company reported net profit of HK$1.9 billion ($245 million) for the quarter ending March, a 1.9 percent drop on the same period a year ago. Gross revenue from games of fortune in Macau was 360.7 billion patacas ($45.2 billion) in 2013, according to Macau’s Gaming Inspection and Coordination Bureau.